A growing number of more technical tools and techniques in wild animal research make advances in our understanding of animal behaviour and ecology possible. Many of the most fundamental and important tools and techniques remain rudimentary however, like ways to identify individual animals. Nevertheless, the successful application of even rudimentary techniques has its challenges. The accurate and repeatable identification of individuals is critical to studies of wild animal behaviour and ecology, and the demography of populations. It allows us to reliably attribute different observations at different times to the same individual. From individual observations we can build an understanding of how populations’ respond to change. In wild animal research identification must be possible quickly from a distance. Animals might not be approachable. They may flee from the researcher or live in habitats where visibility is poor. Fortunately, it is comparatively easy to distinguish individual horses. The coat (pelage), and mane and tail, colours of horses vary in ways that are richly described by the equestrian community. Horses can be black, chestnut, bay, dun, roan, palameno, appaloosa, and many more. 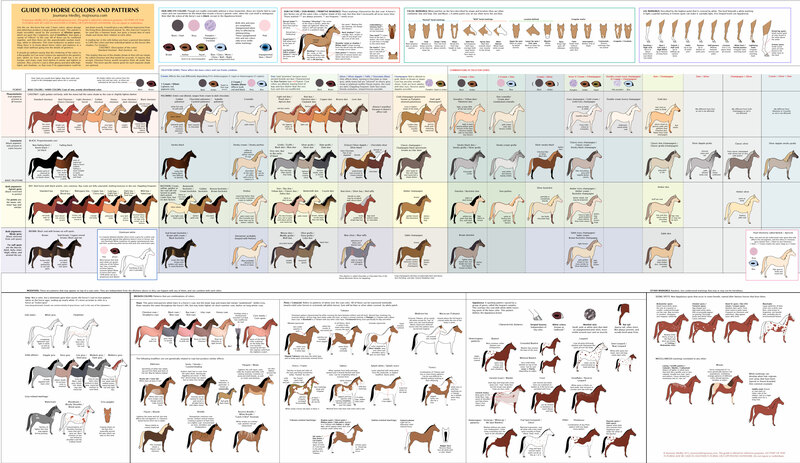 Some resources for understanding coat colour are fun. Coat colour is an excellent first step towards identification because it highly visible from all perspectives. Mary’s band, Kaimanawa Ranges circ. 1994-98 – a diversity of coat colours. How variable coat colours are will depend on how many breeds contributed to the feral population. 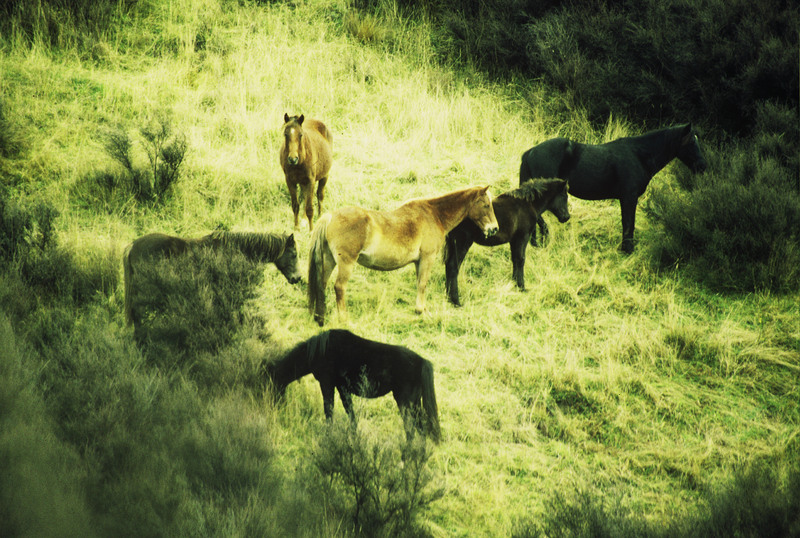 In the Kaimanawa Ranges, for example, breeds used by the military and local farms, and both riding and pack horses during the regions colonisation by largely British immigrants contributed at different times to the feral population and so coat colour is moderately diverse. Coat colour variation is less variable in other populations, particularly those in Europe managed as ancient breeds. Coat colours are more variable in other populations, especially populations in North America that resulted from releases of horses at different times by a diversity of European colonists. Fortunately, even horses in populations with limited coat colour variation can be distinguished by highly variable patches of white hair on their face and feet. These too have a ready-made official and richly descriptive language. White markings on the face might include a star, strip, snip or full blaze, depending on their position and extent, and occasionally faces are entirely white – a condition called ‘bald’. Chins may also be white, even if the face is not marked. White markings on the face are a particularly useful second-step towards identification because even startled horses will turn to look at a researcher. For horses without white facial markings, the position of the hair whorl – also called a cowlick, swirl, crown, or trichoglyph – might be helpful. The hair whorl results from variation in the direction that short air grows and most horses have a hair whorl on their face. Again there is a rich vocabulary describing small differences in whorls. Most are not useful for identifying wild horses from a distance – being often small – but the position and shape of larger hair whorls might be useful because they can be low or high on the face, and variously circular or linear. White leg markings add considerably to the variety of identifying marks, especially because marks on different legs are seldom the same. It is rare for the leg to be white if the foot is not and so white markings on the feet are most often described by the height of the mark. Only the heel or coronet (the band of hair circling the hoof) might be white, or the mark extend upwards above the hock – progressively described as a pastern, fetlock, sock, and stocking. For a few horses, white patches on flanks and belly can also occur. Some wild horses might also have feathered feet, especially if breeds of heavy (work) horses have contributed to the population. Marks on legs, although more variable than facial markings or coat colour, are usefully a third step towards identification because lower legs are sometimes not visible in tall vegetation and certain identification, if leg markings alone are used, might require seeing more than one leg. Other rarer types of natural variation in a horses’ appearance can be useful such as scars, or indentations in the muscle – called dimples, especially if they occur in easy to view places like the face, neck, and flanks. These are seldom used in wild horse identification, however, because it is unlikely that the most difficult to distinguish individuals have them. I have outlined only those marks that are permanent. The more often you see an individual the more you can rely on markings that might change. For example, distinctive tangles of hair in the mane or tail that might rip out, or overgrown or split hooves that might break off, would not be reliable features for identification if you did not see the horse frequently enough to know when the feature has been lost. They can, however, aid rapid identification if you are seeing the horse frequently. 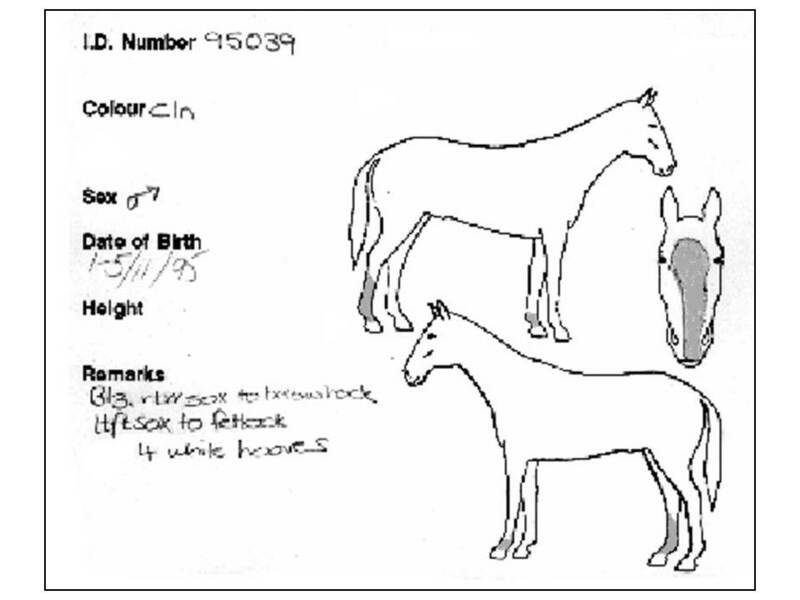 An example of a horse identification card where unique markings on the face, legs and body can be recorded and described for future reference. In long-term studies of wild horse populations descriptions and drawings of each horse’s colour and white markings should be made and catalogued for easy reference to prevent errors of identification. Electronic versions or physical copies might also accompany the researcher into the field site. Many existing formats are available and developed by government and equestrian groups and artists that can be simplified and adopted to your particular needs. Using natural marks like these it is possible to identify almost all wild horses reliably and studies of large populations have been successfully conducted on this basis. Nevertheless, more rapid progress in studies of wild horse behaviour and ecology is made if artificial markings can also be applied. In a future post I will discuss the different types of artificial marking available and their advantages and disadvantages for wild horse studies.